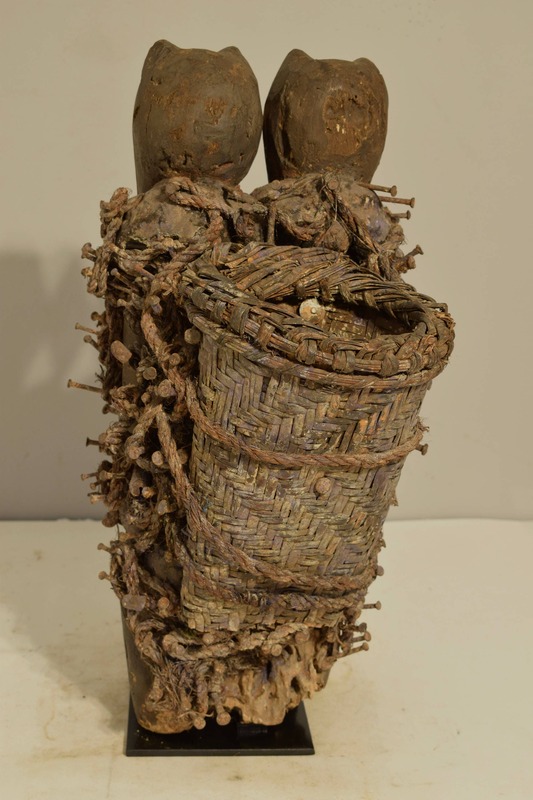 This is a fabulous One of a Kind African Songye Power Figure, "Nkisi" Nail Fetish from the Democratic Republic of the Congo that was created to combat witchcraft and sorcery. They were benign and were believed to bring good, promote fertility and success, vanquish enemies and protect from evil. Large ones were owned by and served the community; small ones were for individual families. 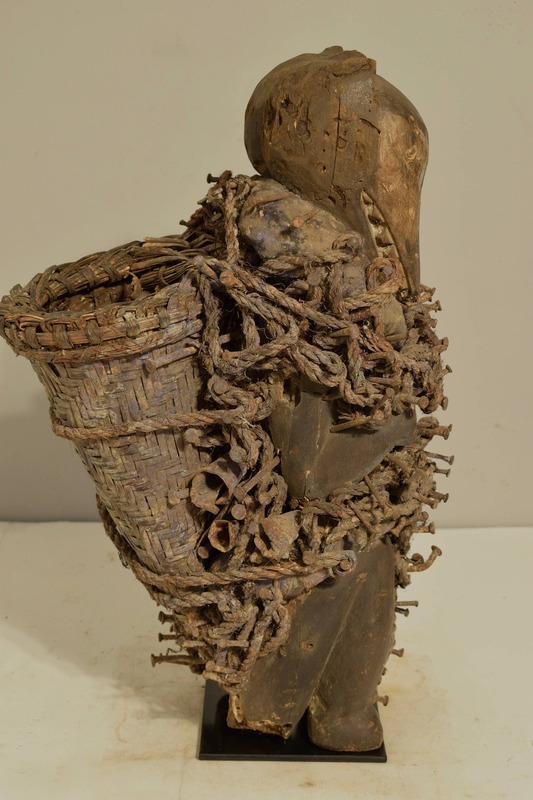 These fetishes were adorned with additional objects, Bajimba, with magical properties horns, skins, teeth, hair, feathers, beads, tacks, mirrors, cloth, baskets and bundles. These figures gained their power not from the carver but from the Nganga, or spiritual leader. Their carving was considered secondary to their power. Often too powerful to touch, they were moved with long sticks. 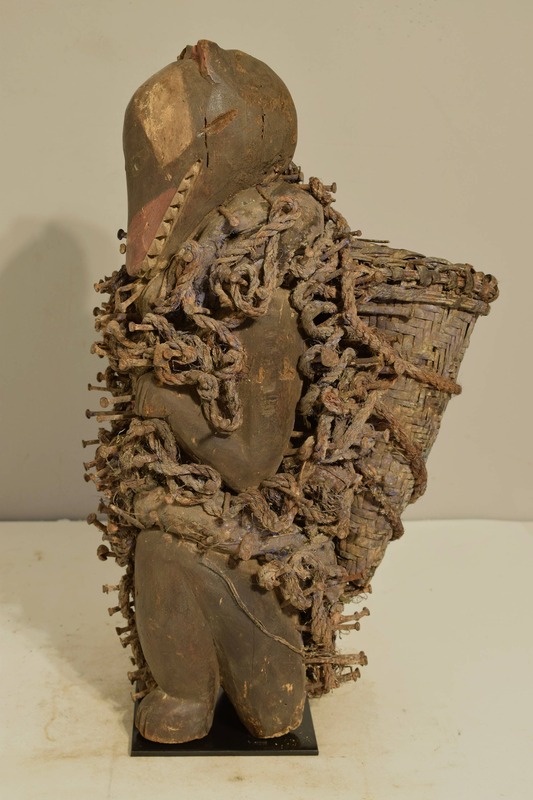 Although protective, these are confrontational objects, with a warrior's attitude. 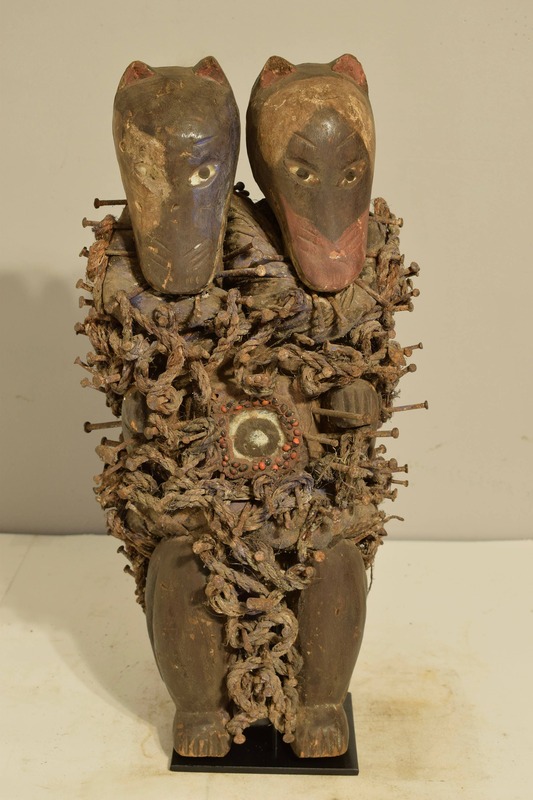 Generally grouped as Nkisi, they were the result of the combined work of two men, the carver and the fetishist. The former created the shape, but without the latter (the Nganga) the figure had no meaning. It was the Nganga who filled it with magic substances and completed the rituals which gave it supernatural powers. This is a magnificent Songye Nail Fetish and would compliment your collection or home. Shows age, discoloration and loss of patina, scratches, cracks and missing pieces of wood, but overall in good condition.